March 23, 2011, was the 1-year anniversary of the Patient Protection and Affordable Care Act, better known as health care reform. Despite having lived with this monumental legislation for more than a year, there still seem to be more questions than answers. This article addresses some of those questions. To begin to understand health care reform, one must first understand the “why.” Our country has struggled with this issue for a very long time. In 1912, President Theodore Roosevelt was the first to campaign on a platform that promised national health insurance. He was defeated by Woodrow Wilson.1 Efforts to improve on or create a national health care system were called for again in 1932 by the Committee on the Cost of Medical Care, in 1934 by President Franklin Roosevelt’s New Deal, by President Harry Truman in 1945, in 1962 by President John F. Kennedy, in 1972 in the Nixon/Kennedy debates, and later by the Carter, Reagan, and Clinton administrations. What caused this disparity? The factors are numerous. The U.S. government spent $2.3 trillion on health care in 2009, more than three times the $714 billion spent in 1990, according to the Kaiser Family Foundation. It’s generally accepted that medical technology and innovation have been a driver. Not only have the types and variety of medical and pharmaceutical services increased dramatically, but so has patients’ ability to learn about and access these technologies. Administrative inefficiencies have been cited. The current system suffers from a lack of coordination—for example, each payer generally has its own billing system. This is further aggravated by a payment system that tends to pay by tests or exams ordered instead of the outcomes achieved. Health insurance mandates make an impact. A mandated benefit is a law that requires a health insurance company or policy to cover specific providers, procedures, benefits, or people. The Council for Affordable Health Insurance estimates that mandates can increase the cost of an insurance policy from 10 to 50 percent. Other factors often recognized include our aging population and cost shifting from public to private payers and from the uninsured to the insured. The legal environment contributes in the form of rising medical malpractice premiums. 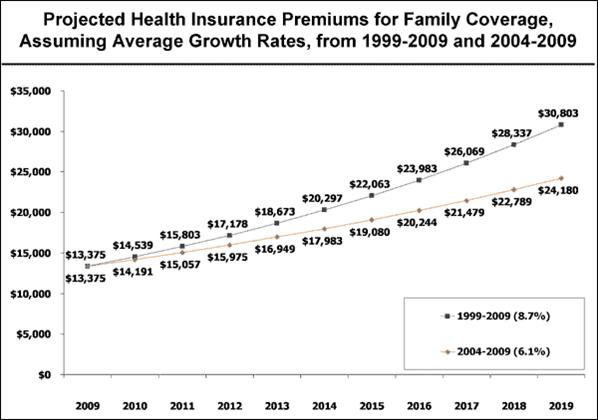 All things considered, however, perhaps the best indicator of what may be driving health care cost increases is the negative trend in certain health indicators over the last 20 years, including the following. In 1991, 7.2 million Americans had diabetes. Today, the number is estimated to be 23.6 million. Twenty years ago, 12 percent of the country was obese. Today, it is nearly 26 percent. Only 64 percent of employers offer health benefits to their employees. (This can be as low as 39 percent for employers who have many lower-wage or part-time workers. )5 In 2010, the Census Bureau estimated that more than 50 million Americans are uninsured. There was a significant increase over the last couple of years, which is blamed on rising costs, the recession, companies dropping employee health insurance benefits, and families going without coverage to cut costs. Many who find themselves uninsured have access to some form of safety net. Generally referred to as risk pools, these programs allow individuals denied coverage by private insurance companies to access state-sponsored health insurance plans—albeit at a higher cost than if they were able to qualify for a private plan. Currently, 34 states offer some form of risk pool, and these risk pools cover about 183,000 people. Risk pools come in a variety of forms. They can be a temporary stopping point for individuals who are denied health coverage, or they can be a catch-all for those who have no other way to purchase insurance. Some risk pools have done an excellent job of providing alternatives, while others have done very little because their health insurance plans are not designed well, are not funded properly by their states, or are simply unaffordable. The Kaiser Family Foundation has estimated that by 2019 family premiums will cost between $24,000 to $30,000. When you take all this into consideration—the rising costs, the negative health indicators, the decreasing numbers of employers offering health insurance, the rising uninsured population, the inconsistent success of risk pools, etc.—it leads to only one conclusion: We had a problem. Health care reform is really a combination of two pieces of legislation: the Patient Protection and Affordable Care Act passed on March 23, 2010, and the Health Care and Education Reconciliation Act of 2010, passed March 30, 2010. The signed legislation contained over 2,400 pages before clarifications, rulings, or determinations were made by the various governmental departments tasked with defining and enforcing it. Some features of health care reform should already be familiar, as many have already gone into effect. Others may or may not apply, depending on whether one has “grandfathered” status. Health care reform covers a scope of topics that far exceeds what the media covers. That scope also exceeds what is practical to include in this article. The Kaiser Family Foundation has created an interactive tool designed to explain how and when all provisions of the law will be implemented at http://healthreform.kff.org/timeline.aspx. Expanded Insurance Coverage: Health care reform contains some provisions designed to improve access to health care coverage. Health Insurance Reform: Health insurance issuers are required to reform certain insurance practices and improve the coverage available. Health Plan Administration: Health plans will be subject to increased administrative duties under health care reform. Fees and Taxes: With a total estimated cost of more than $900 billion dollars, the reform of the nation’s health care system comes with additional costs and fees. These fees will also be implemented over the next several years. However, health care reform also includes some subsidies, in the form of tax credits, to help individuals and businesses pay for coverage. Extended coverage for young adults: Group health plans and health insurance issuers offering group or individual health insurance coverage that provide dependent coverage of children must make coverage available for adult children up to age 26. There is no requirement to cover the child or spouse of a dependent child. This requirement applies to grandfathered and new plans. Identifying affordable coverage: As required, the Secretary of Health and Human Services has established a website through which residents of any state may identify affordable health insurance coverage options in that state at www.HealthCare.gov. Nondiscrimination rules for fully insured plans: Fully insured group health plans will have to satisfy nondiscrimination rules regarding eligibility to participate in the plan and eligibility for benefits. These rules prohibit discrimination in favor of highly compensated individuals. This section does not apply to grandfathered plans. This provision was set to take effect for plan years beginning on or after September 23, 2010, but has been delayed indefinitely pending the issuance of regulations. The regulations will specify the new effective date. Small business tax credit: The first phase of the small business tax credit for qualified small employers began in 2010. These employers can receive a credit for contributions to purchase health insurance for employees. The credit is up to 35 percent of the employer’s contribution to provide health insurance for employees. There is also up to a 25 percent credit for small nonprofit organizations. When health insurance exchanges are operational, tax credits will increase, up to 50 percent of premiums. Indoor tanning services tax: One additional tax imposed by the health care reform law is a 10 percent tax on amounts paid for indoor suntanning services. Voluntary long-term care insurance options Health care reform creates a long-term care insurance program for adults who become disabled. Participation will be voluntary, and the program is to be funded by voluntary payroll deductions to provide benefits to adults who become disabled. Although the program was technically effective January 1, 2011, significant portions are not required to be established until 2012. Improving medical loss ratios: Health insurance issuers offering group or individual health insurance coverage (including grandfathered health plans) must annually report on the share of premium dollars spent on health care and provide consumer rebates for excessive medical loss ratios. Standardizing the definition of qualified medical expenses: The definition of “qualified medical expenses” for Health Savings Accounts (HSAs), Flexible Spending Accounts (FSAs), and Health Reimbursement Accounts (HRAs) must conform to the definition used for the itemized tax deduction. This means that expenses for over-the-counter medicines and drugs may not be reimbursed by these plans unless accompanied by a prescription. Increased tax on withdrawals from HSAs and Archer Medical Savings Accounts (MSAs): The additional tax on HSA withdrawals prior to age 65 that are not used for qualified medical expenses increases from 10 to 20 percent. Reporting health coverage costs on Form W-2: Employers will be required to disclose the value of the health coverage provided by the employer to each employee on the employee’s annual Form W-2. Note that this requirement is effective, but optional, for the 2011 tax year and will be mandatory for later years for most employers. This requirement is optional for small employers (filing fewer than 250 Form W-2s), at least for the 2012 tax year, and will remain optional until further guidance is issued. Limiting health FSA contributions: The health care law will limit the amount of contributions to health FSAs to $2,500 per year, indexed by CPI for subsequent years. Increased threshold for medical expense deductions: The income threshold for claiming the itemized deduction for medical expenses will increase from 7.5 percent of income to 10 percent. Individual coverage mandates: The health care reform legislation requires most individuals to obtain acceptable health insurance coverage or pay a penalty. Employer coverage requirements: Employers with 50 or more employees that do not offer coverage to their employees will be subject to penalties if any employee receives a government subsidy for health coverage. The penalty amount is up to $2,000 annually for each full-time employee, excluding the first 30 employees. Employers will be required to report to the federal government on health coverage they provide. The health care reform legislation provides for health insurance exchanges to be established in each state in 2014. Individuals and small employers will be able to shop for insurance through the exchanges. Small employers are those with no more than 100 employees. Large employers with more than 100 employees are to be allowed into the exchanges in 2017. Annual limits: Restricted annual limits will be permitted until 2014. However, in 2014 the plans and issuers may not impose annual limits on the amount of coverage an individual may receive. Excessive waiting periods: Entities offering group coverage will not be able to require a waiting period of more than 90 days. Limits on cost-sharing: Non-grandfathered group health plans will be subject to limits on cost-sharing or out-of-pocket costs. Employer wellness programs: Existing wellness regulations under the Health Insurance Portability and Accountability Act (HIPAA) permit wellness incentives of up to 20 percent of the total premium. Under health care reform, the potential incentive increases to 30 percent of the premium. Takes an increase in taxes, fees, and premiums. Obligates employers to shoulder operational burdens. Offers immediate and future tax credits to small business. Requires significant expansion of government. Requires most people to have insurance by 2014, which should slow the growth of the uninsured. Overhauls Medicare and Medicaid to make these systems more efficient. Will require extensive clarification from a variety of government entities. There are several onerous conflicts built into the legislation. For example, insurance companies will be required to offer insurance to all people regardless of pre-existing conditions. This works when everyone has coverage, yet the individual mandate is riddled with exclusions and lacks strength—as well as facing significant legal challenges in the courts. These types of conflicts, and the sheer size and scope of this legislation, makes one wonder if it is all achievable. While the bill was focused on increasing the number of insured lives, the question is whether the cost and administrative burden it creates will exceed its benefits. Follow a health insurance carrier or another reliable source through Twitter, directly on their websites, or through a newsletter subscription. Clarifications and updates to the original legislation are happening frequently. Understand the basics this article has outlined. Begin to evaluate the role employee benefits, and health insurance specifically, play in the changing dynamics between employer and employees. Remember to vote and make your voice heard. Whether celebrating health care reform or quaking with anger when it is mentioned, realize there are still ways to improve or modify the legislation. Finally, if it’s all just too much, take the path less traveled. Go be healthy. Perhaps if we had all done that in the first place, none of this would have been necessary. 2. Kaiser/HRET Survey of Employer-Sponsored Health Benefits 1999-2009. 3. Towers Perrin 2010 Health Care Cost Survey. 5. Kaiser/HRET Survey of Employer Sponsored Health Benefits 2009.